The Japanese apparently really love the idea of using a PlayStation 3 to record television shows. Sony's torne, a digital video recorder kit developed for use with the PlayStation 3, finally landed on Japanese shelves this week to a huge response from consumers. The device can record shows to a PS3 or a USB hard drive, which can then even be streamed to a PSP. Torne was expected to be a hit product, receiving loads of coverage in magazines like Famitsu. Famitsu actually rated the device with scores of 9s and 10s, with one reviewer saying he wishes he could have given it a 20. I've got to say, for its approximate $100-$110 cost, it does sound like an incredible product, as DVRs like Tivo can easily cost at least twice that, while cable companies can have consumers dishing out $20 a month or more for DVR service. 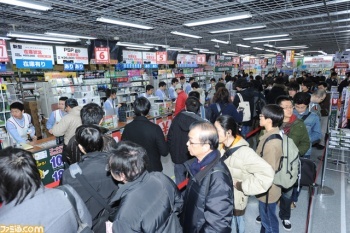 Many Japanese stores such as the Akihabara district's popular Yodobashi Camera saw hundreds of people line up for torne. Yakuza 4 for the PlayStation 3 and Gundam Assault Survive for the PSP were also released on the same day, but consumers primarily were out in pursuit of the PS3 DVR. Most stores sold out by the afternoon, with some sending customers away from lines before even opening their doors. I'm hoping torne will make its way over to other regions eventually, but ideally its name will be fixed first because the whole non-capitalization thing is really freaking me out. Using a DVR is the only way to watch television nowadays, and combining that with PSP and PS3 functionality seems like a huge bonus. Now that torne has finally been released, I want to know how to get all of its trophies.